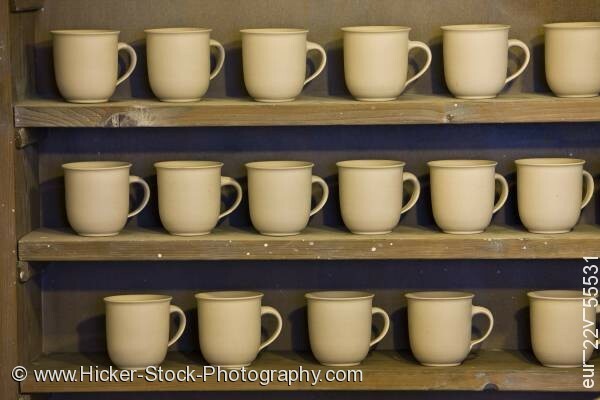 Stock photo of a pottery exhibit at Hessenpark (Open Air Museum), Neu-Anspach, Hessen, Germany, Europe. This stock photo shows a display of clay pottery at an exhibit at Hessenpark (Open Air Museum), Neu-Anspach, Hessen, Germany, Europe. A wooden display with three shelves has several white drinking mugs. A simple smooth design is made with a curved handle and turned lip around the top of the clay mug. All the mugs are soft white giving a wonderful contrast to the deep brown color of the wood of the simplistic display. The neat display shows the bottom shelf with five cups while the two above displays six cups each and their seventeen handles face to the right. This pottery display is found at the Hessenpark (Open Air Museum) in the town of Neu-Anspach of Hessen, Germany. This open air museum was founded in 1974.